I have a long list of vegetables that I want to try, so when the opportunity arose to try parsnips over Christmas I was thrilled! Everyone loved these sweet vegetables and were asking for seconds! Parsnips are similar to carrots in shape and texture, but are slightly sweeter. You want to choose parsnips like you would a carrot, making sure they are smooth and blemish free. And, you're in luck! Winter parsnips are sweeter than fall parsnips so hurry and get some now! Prepare parsnips just like carrots by washing and peeling first. However, larger parsnips can have a very woody core (you can see it when you cut it lengthwise) and its best to remove it so it's not too tough. I served these with my roasted fingerling potatoes and ribs for a family dinner, and it was delicious! Just to show you what they look like in comparison to one another. Toss with olive oil, salt, and pepper and rosemary and roast for 45 minutes to an hour. Wash and peel carrots and parsnips. Remove the woody core from the larger parsnips after cutting them lengthwise to expose it. Then slice into smaller pieces as desired [I halve them lengthwise and then cut them diagonally into about 4ths]. 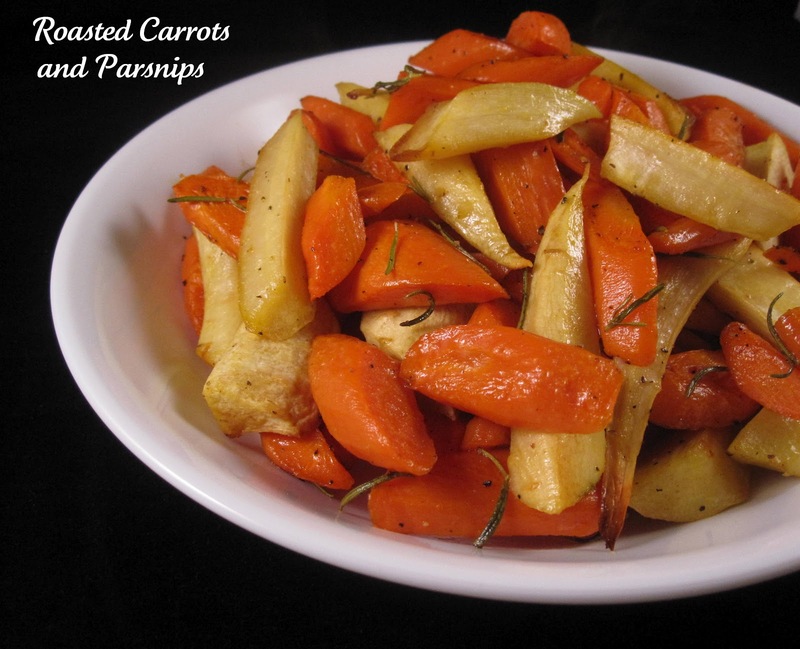 Toss cut carrots and parsnips in a bowl with olive oil, rosemary, salt and pepper. Spread onto a foil lined baking sheet. Roast at 400 for 45 minutes-1 hour or until both vegetables are soft when pricked with a fork. *Note, typically you do not serve food with cooked rosemary sprigs as you see in my pictures, I merely forget to remove them! Keep fresh rosemary in sprigs so it's easy to remove after cooking. Rosemary needles are not very pleasant to eat, so remember to remove them!! Do you have other favorite recipes you make with parsnips? ?